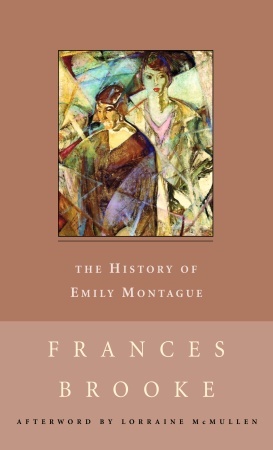 “Frances Brooke’s The History of Emily Montague is a charming love story which captures the lives of Quebec City’s early English-speaking inhabitants, the Québécois, and the Native people, in the decade between Wolfe’s victory on the Plains of Abraham in 1759 and the American War of Independence in the 1770s. I was looking forward to reading this first of North American novels, and for the most part I wasn’t disappointed. The epistolary format gave Brooke an ideal opportunity to describe the landscape of the Canadian wilderness and the cultural environment even at that very early period. I was excited at the thought of having a window into that oh-so-close-to-conquest Quebec–would there be a sense of loss? a diminishment of the people? an animosity toward the English? How would the English women feel about living within these militarised outposts of civilisation surrounded by wilderness? What views did the ordinary European visitor or settler have about the native population? Did they see themselves as trespassers or missionaries? Or was there just so much space that the native people were largely ignored? Fascinating questions, and The History of Emily Montague provides plenty of answers–some surprising, some not. It bogged down a bit about three-quarters of the way through–I was impatient to see the main plot resolved, but wasn’t expecting the little twist at the end.